The Series WD3 Water Leak Detectors protect equipment from water damage by detecting the presence of water in drip pans in air handler units, under raised floors in data centers, or on floors around sump pumps and drains. Water is detected once it reaches a level that bridges the two conductive strips on the bottom of the housing. Depending on the model ordered, audible and visual alerts provide local indication of the alarm condition and an internal switch will give remote indication or control to prevent further build up of water. For applications where power is not available, the Model WD3-BP-D1-A is battery powered. 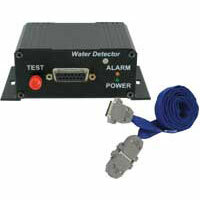 Otherwise, either AC or DC supply voltages can be used to power the water detector. The sensing height can be adjusted to as low as 1/32" using the included adjustable mounting bracket. The mounting bracket can attach to any flat surface by either using the attached adhesive strips or mounting screws. Battery powered models: SPST NO SSR; External powered models: DPDT relay. Battery powered model: Pilot duty rating 250 mA @ 24 VDC; External powered models: 1 A @ 24 VAC/DC. At least 85 dB @ 1' distance (depends on model). Red LED for water level; Yellow LED for low battery (battery powered models only); Green LED for power condition (external powered models only). Battery powered model: 3V CR2450 lithium metal battery, installed functional, user replaceable; External powered models: 24 VAC (±10%) or 11 to 27 VDC. Battery powered model: 0.9 mA steady state / 3.0 mA during alarm condition; External powered models: 30 mA steady state / 85 mA during alarm condition. 5 years steady state / 48 hours during alarm condition. 4.9' (1.5 m), 22 AWG, PVC, UL plenum rated cable. ABS and polycarbonate with flammability classification UL 94 V-0. Audible alarm models: Watertight up to 3/4 of the body height; Non-audible alarm models: NEMA 6P (IP68) submersible.